Documentary filmmaker Mai Masri has a history of crafting films about Palestine under occupation, detailing the experiences of children in refugee camps and offering a candid glimpse at the world within areas like Beirut or the West Bank. This is why it's no surprise that her debut narrative feature, 3,000 Nights, is an authentically rendered and elaborate metaphor for the experiences of those living amidst the conflict in the Middle East. It starts after the impetus of conflict. Layal (Maisa Abd Elhadi), a new bride, has been charged with aiding a Palestinian militant group in a strike against the Israeli Army. In truth, she picked up a teen hitchhiker while driving who was involved in the attack, unbeknownst to her. Amidst the arguments and chaos swirling around her, it's implied that she should lie in the courtroom and claim that the boy threatened her, which would simultaneously make her act of kindness more palatable for the court and allow them to pin additional charges onto the boy. When she doesn't comply, she's thrown in prison for the titular 3,000 nights (roughly) and forced to adapt to a new code of order and ethics. 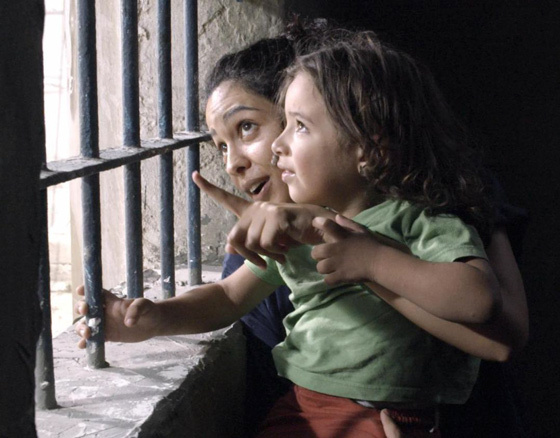 There are a few things going on in Mai Masri's highly detailed and polished prison drama. Shortly after Layal arrives there, she learns that she's pregnant. Her husband tries to get her to abort it, but she, perhaps out of a need for connection at such a difficult time, wants to keep it. Furthermore, her husband learns that their Canadian immigration application has gone through, which he intends to use. These factors, which are established early on, give 3,000 Nights a template of independent maternal strength; despite her harsh environment and the odds that are against her, Layal is determined to raise a good son. Outside of this basic setup of giving birth in prison — one that works as a metaphor for raising a child in the middle of an ongoing war — there's also a Palestinian insurgency developing around Layal, which she learns of promptly when Israeli inmates abuse her and accuse her of passing letters outside of the prison. Since prisoners are given preferential treatment based on religious beliefs, Layal is forced into an ongoing battle for basic rights and dignity. While all of this combined is quite heavy, firmly planting 3,000 Nights within the lexicon of politicized cinema, Masri lays it out deftly, never with a heavy hand. There are moments of levity, human compassion, tenderness and, above all, hope amidst the prison battles, physical altercations and degradation. This is a balanced film that looks to capture the truth of the moment rather than force the audience into an opinion through emotional manipulation. It's a logical tactic for someone schooled in the documentary form and stems, in part, from Masri's preparation for this shoot, interviewing prisoners and getting a good understanding of the social and structural dynamic of such an environment. The end result is a film that has an abundance of integrity if very little aesthetic appeal. This isn't a stylized film, and there's little effort to match form with content, save the looseness that's typically associated with realism. Despite this lack of capitalizing on the full extent of the medium, Masri's narrative debut is quite inspiring and eye-opening, telling us the story of one woman, amidst many, fighting for her own silver lining from within a literal (and metaphorical) prison.